There is a strange fascination with celestial events, and I love to try to capture them with the camera. But the moon is a real challenge isn’t it? Especially the full moon. Have you ever seen those movie shots of the moon looking enormous – perhaps with a boy and an alien on a bicycle? This shot unexpectedly went a bit viral, being featured on a range of news and astronomy websites around the world. Let me take you behind the scenes to show you how I captured this shot without any fancy photoshop wizardry or collaging of multiple shots. Before moonrise I set up on some open grassland near my home in Canberra and pointed the camera at the top of a hill about 2km away. I used an iphone app called Sun Surveyor to work out roughly where the moon would rise, and positioned myself to try to catch the moon behind the lonely tree on the hill. The camera is a Canon EOS 60D – a good mid-range DSLR camera with a cropped sensor. The new version of this camera is the Canon EOS 70D . I used the Canon EF 100-400mm L-series lens to achieve the large moon. 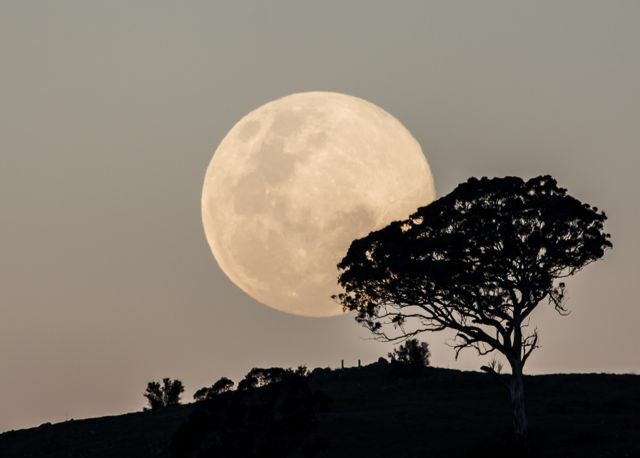 While it was a ‘supermoon’ – a full moon on its closest approach to the Earth – it is of course not that size to the casual observer. One characteristic of zoom lenses is that they compress the space between distant objects and ourselves. The lens was already focussed at infinity with the tree in focus, so the moon was also in focus, but looming large against the tree. It is a useful effect of the physics of light as it travels through the lens. A tripod is pretty essential for anything with a long zoom in order to keep it steady. The tripod should be as sturdy as you can make it. But you don’t have to spend a fortune. One trick is that the tripod can be cheap and cheerful, but it is worth spending money to get a good tripod head so that the camera can be set up without it sagging. And don’t forget to turn off the image stabilising when mounted on a tripod – if you don’t it will try to counter a vibration that isn’t there – and will actually introduce movement that you really don’t want. Use mirror lockup and if possible a remote trigger – or use the camera’s timer on a 2 second delay. One useful trick is to use the rear screen at 10x magnification – you will soon see when it is in focus – it works great for those times when there is just not quite enough light to use auto focus. The moon will appear to move quite quickly due to the Earth’s rotation, so don’t be afraid to use a higher ISO to get a shorter exposure – you can deal with noise in post processing, but not movement blur. I used a device I just acquire recently – a Vixen Polarie Star Tracker . This is a device about the size of a camera body that fits on the tripod and to which you attach another tripod head to mount the camera. It’s purpose is to keep the camera aligned with the sky – in this case the moon – so you can focus on focussing, and not worry about the moon racing out of the view finder. More on this later when I write a proper review. It is great for any type of astrophotography. A lot of people – myself included – find it difficult to get the right exposure setting for the moon. The thing to keep in mind is that the moon is quite a good reflector of the sun – so you are dealing with reflected sunlight. So start with a good shade setting – say around ISO400 with an exposure of around 1/250 sec at f/5.6. For the image above, I used ISO100 exposed for 1/90th sec at f/5.6 because it was still somewhat light being just after sunset. I nearly missed this shot. The sun surveyor will only give an approximation, so at the last moment I had to grab the whole rig and move it about 6 metres to get into the right position. Also just after this shot, I noticed a flicker of movement which I though might be a bird. I took the shot anyhow… and caught a small plane against the moon! So keep your eyes on the prize and prepare for the unexpected – you never quite know what you’ll get on the day – even with good preparation!